Megha was a married school teacher and mother of two girls.In our society, girls are always considered as a burden for the family, even in educated families. So, she got pregnant third time because both her mother and mother-in-law wanted a baby boy from her. But the ray of hope got finished when she gave birth to a baby girl. At the time of child birth, a group of transgenders came to bless the newborn child. But everybody in Megha’s family were in deep sorrow. In our civilized society, transgenders can’t be considered as human being like normal people but Trangenders are also human being which are incomplete people created by god. Durga (head of that transgenders community) felt sad because she came to bless the newborn child but she saw the abusing of the newborn child by her own family members.She began to say ” How bad people you are? We are better than you because we can understand the people belong to our community but you(ladies) can’t understand your community.I will not take any gift, money, etc. from you but I will bless the newborn and cursing you that baby boy will not born in your family, otherwise, you will always abuse your daughters.”Then, Durga and other transgenders gifted some chocolates to Megha’s daughters and blessed them because the relation of humanity is biggest from any other relation. After listening the words of Durga, Megha and her mother-in-law felt ashamed because Durga had opened the eyes of Megha, her mother and mother-in-law like goddess Durga. If a woman can’t understand the existence of another woman, then how can a woman take right to live because nobody thinks that girls are also human being, and an important part of our society.In our society, boys are always considered to increase the family tree but people had forgotten the role of girls in our society. Megha decided not to give birth to baby boy and to take care of her daughters by good education which was the result of Durga’s step to eradicate the gender bias in our society who was neither a man nor a woman , but a human being in real sense. 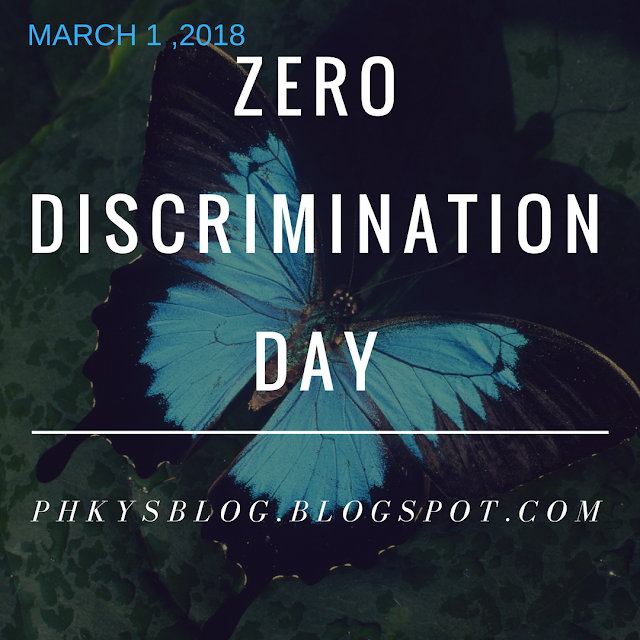 Zero Discrimination Day is an opportunity to highlight how everyone can be a part of the transformation and take a stand towards a more fair and just society. This year’s Zero Discrimination Day campaign invites people to ask themselves “What if …” and to reflect upon their own actions. -What if the person you bought your vegetables from was living with HIV? Would you buy tomatoes from him? -What if your neighbour had tuberculosis? Would you stop to chat? Discrimination is dehumanizing. When you treat someone differently solely based on race, gender, age, etc., you deny the value of who they are as an individual. Discrimination hurts. Whether discrimination is subtle or overt, people know when they are being discriminated against, and it’s painful. Never again say anything negative or derogatory about anyone as it relates to things outside their control. Be more aware of discrimination. When you witness it, ask yourself if there is anything you can do personally to remedy the situation. Then do it! Be intentional about giving favor to those whom you know are being discriminated against. Say the words and practice the behavior you want children to imitate. As parents and teachers, we have a huge influence on our children and their views. Guard your thoughts and words when with those who make discriminating remarks. Stand up for what’s right. Choose your friends carefully. People who discriminate are not friends of mine. Remember that you are the average of your five closest friends. Allowing discrimination to continue is not only wrong, it is bad for communities, bad for the economy and bad for the future. Discriminating against women affects food production: women make up 43% of the agriculture workforce in developing countries and yet only 5% are able to access agricultural advisory services. Access to health services is essential to prevent and treat HIV. And yet approximately one in five people living with HIV reported avoiding going to a local clinic or hospital because they feared stigma or discrimination related to their HIV status. Discrimination will not disappear without actively addressing the ignorance, practices and beliefs that fuel it. Ending discrimination requires action from everyone. Zero Discrimination Day is an opportunity to highlight how everyone can be a part of the transformation and take a stand towards a more fair and just society. Zero Discrimination Day has been observed every year since 1 March 2014. The symbol for the day is the butterfly, widely used by people to share their stories and photos as a way to end discrimination and work towards positive transformation. The End of Discrimination Starts With You because you are the only person you can change. If enough of us make a daily, conscious effort not to discriminate, it is possible for real societal change to take place. In my own personal life, I am more prone to help someone who I believe is discriminated against than someone who is not. When I see that someone is disadvantaged because of something beyond their control, I go out of my way to befriend them and help in any way I can. Therefore, I am challenging you to start looking at everyone as equal, and going above and beyond to support those who likely feel discriminated against. When you do, you benefit from knowing it’s the right thing to do. In addition, you will be showing greater respect to those around you and will present yourself as someone with a balanced and tolerant worldview. Insightful. Keep it up ma'am.